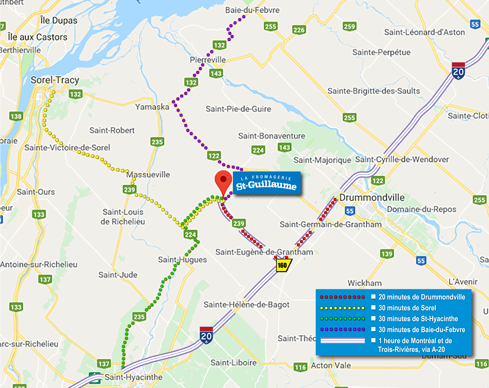 The St-Guillaume Cheese Dairy operates a unique interpretation center. Visitors to the central Québec region will discover how cheese is made as well as how cheese has become an integral part of Quebec culture. Experience cheese in a whole new way! Your visit to our interpretation center will be not only educational but also interactive. During your guided visit, you will learn how to press cheese—and bring a fresh batch home! What's more: we will teach you all about the cheese making process and make sure you have a truly unforgettable experience. 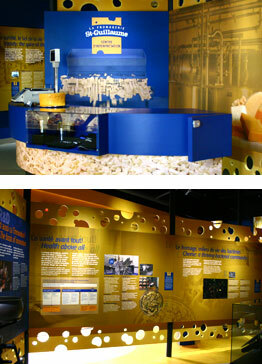 The St-Guillaume Cheese Plant Interpreation Centre is open 6 days a week. All ages welcome! Tuesday through Friday : 10 a.m. to 5.30. p.m.
Saturday* and Sunday : 11 a.m. to 5.30 p.m.
* There is no cheese production at the plant on Saturdays.